The elevation of Lake Roosevelt was 1271.0 feet above sea level at 7 a.m. on April 24, 2019. The level is expected to rise between 1272 - 1275 range between now and the end of the week of the 21st. The April Water Forecast has been issued by the U.S. Army Corps of Engineers. Based on current conditions, the April 30th flood control elevation for Lake Roosevelt is 1278.9 feet above sea level. The lake level target provided in this report is only a prediction and subject to change without notice due to power operations, river operations, emergency situations, changes in weather or other unforeseen circumstances. Lake level forecasts are updated by 3 p.m. each day. Please call 1-800-824-4916 for the updated 24-hour forecast. How do I find historical lake levels? Click on “Historical Data Access"
A listing of historical daily lake levels will appear. Why does Lake Roosevelt fluctuate? Lake Roosevelt is a working reservoir. It is the main storage reservoir on the Columbia River for the United States. The reservoir is lowered in the spring, to make room for the spring runoff. This prevents flooding on the lower Columbia River. The water that enters Lake Roosevelt during the spring is stored in the lake and is used later in the year for power generation and to enhance river flows downstream for endangered species of fish when flows on the Columbia River drop later in the summer and fall. What are flood control elevations? Flood control elevations are the maximum elevations the lake can be at in order to accommodate the spring runoff. Flood control elevations at Lake Roosevelt are determined by the Water Supply Forecast (WSF) for the Columbia River at The Dalles, Oregon. Snowpack and precipitation amounts in the Columbia River Basin, including the US and Canada, are the main factors used to help determine the WSF. The WSF and the resultant flood control elevations vary year by year and month by month depending on the weather and the depth of the snowpack. The official flood control elevations are set beginning in January and are updated each month through April. 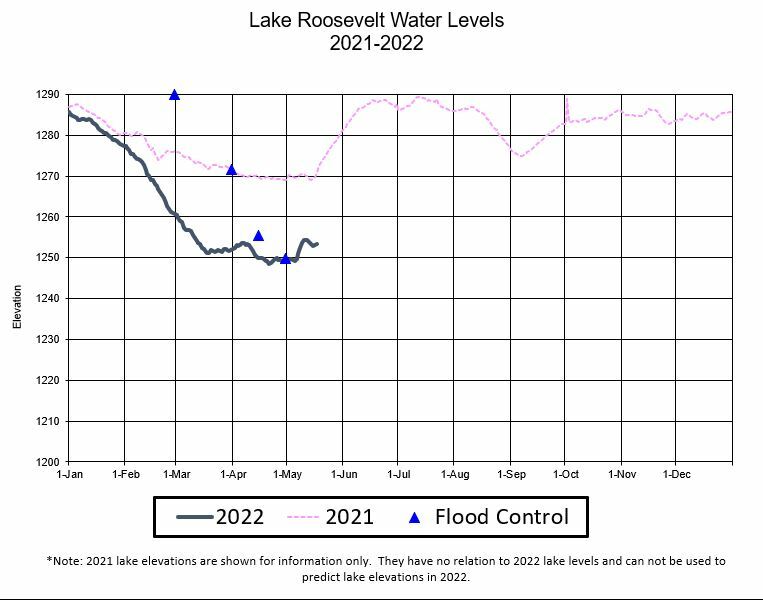 In years when there is a lot of snow and a high WSF, Lake Roosevelt will be drawn down quite low for flood control. Lake Roosevelt will remain higher when the snowpack and the WSF is low. How far can Lake Roosevelt be drawn down? The range of elevations for the operation of Lake Roosevelt is 1208 – 1290 feet. Below 1208 feet, the power generating capacity of Grand Coulee Dam quickly diminishes. Who controls the level of Lake Roosevelt? The Bureau of Reclamation operates Grand Coulee Dam, which requires the release of water from Lake Roosevelt through the dam for power generation. However, power generation is not the only factor in determining lake levels. Flood control, as determined by the Corp of Engineers, is the primary influence on lake levels during the spring. Throughout the year, various river flows targets need to be met on the lower Columbia River for endangered fish species. These flow targets are determined by the FCRPS Biological Opinion, which is a product of litigation concerning the Columbia River. Water is also used in the Columbia Basin for irrigation in the spring, summer and fall, although the influence on Lake Roosevelt lake levels is minor. Why does the lake level rise to full pool (1290 feet) during the Fourth of July when visitation to the lake is highest? The FCRPS Biological Opinion has Lake Roosevelt at the full pool elevation at or around June 30. This is in order to ensure water is stored for power generation and lower Columbia River flow targets later in the year when the river flow into Lake Roosevelt decreases. In addition, because power demand is extremely low during the Holiday, the result is that the lake rises as water is not being run through the generators. Between the FCRPS Biological Opinion which has the elevation coming to full and low power demand, the water level tends to rise over the Fourth of July.